LST‑983 was laid down by Boston Naval Shipyard, 22 December 1943; launched 10 February 1944: sponsored by Mrs. Neal B. Farwell; and commissioned 25 March 1944, Lt. Woodrow W. Weir USNR in command. A week later she proceeded to Portsmouth, Va., where LCT‑659 was loaded on her main deck in preparation for sailing to Europe. She departed New York 18 April 1944 as flagship of LST Group 52, in convoy with 112 ships. The tank landing ship arrived in Londonderry, Northern Ireland, to discharge fuel oil that had been carried across the Atlantic as ballast and then proceeded to Milford Haven, Wales, and Plymouth, England, where she launched LCT‑659. A week later LST‑983 sailed to London. After 2 days in London she moved down to Tilsbury Docks for final preparations for the assault on Fortress Europa. Here she embarked British troops and their cargo and moved further downriver to an assigned anchorage. By evening 3 June, the mouth of the river was full of ships of all types. At 0900 on 5 June she got underway as flagship of the Vice Commodore, TU GL3, which included 27 American LSTs destined for the British sectors of the Normandy beaches. In the early morning hours of 6 June 1944, the convoy was off the Isle of Wight, where it rendezvoused with other ships and then proceeded across the English Channel. The task unit arrived at Juno Beach at 1600 on 6 June, and anchored off the beach. At 2345, the Luftwaffe strafed and bombed the hundreds of ships anchored in the area, but caused relatively little damage. At 0230 the next morning, LST‑983 proceeded to the beach and unloaded, then sailed for Southampton to embark more troops and their equipment. During the first 30 days following D‑Day, LST‑983 made 10 round trips to Normandy, reinforcing the beachhead. Thereafter she continued to shuttle between Normandy and different ports in England, Including London, Portsmouth, Portland, and Southampton. During the Battle of the Bulge early in 1945, the Nazis sent their submarines as well as their soldiers into action, staking all in their last stand. German U‑boats desperately tried to halt the flow of men and material to the French ports. During this critical period LST‑983 was constantly at sea from Portland to Le Havre and Rouen, carrying 500 or more troops on each trip to be thrown into battle. On the night of 12 January 1945, submarines' attacked her convoy as she was returning from Le Havre with seven other LST's, but excellent defense by Canadian escorts drove off the U‑boats. By V‑E Day, LST‑983 had made 46 trips to the Continent. Five more voyages were made, from Tilsbury to Ostend, Belgium. On the last passage she left Tilsbury, entered Germany 25 May, loaded troops, and 5 days later sailed northward through the North Sea to Oslo, Norway, carrying British occupation troops. From Norway, she proceeded to Plymouth for repairs before returning to the United States. She arrived in Norfolk, Va., 17 July 1945, bringing home 103 men freed from German prisons and PT‑199 which had been secured to her main deck for the crossing. During Normandy and later in World War II, LST‑983 crossed the Channel 102 times, transporting over 10,000 troops and over 3,000 vehicles to beachheads and ports of Europe, and returning more than 2,000 prisoners to England. 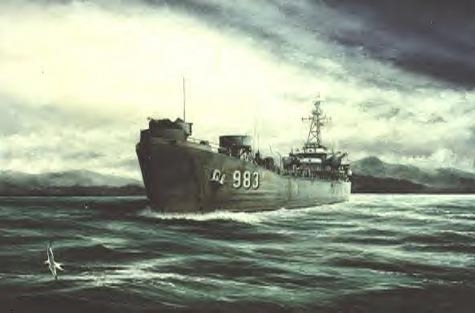 During the decade following World War II, LST‑983 has played a prominent role in the training of Naval, Marine, and Army personnel in the skills needed to maintain a high state of operational readiness. Based at Norfolk, she participated in amphibious training with Marine Corps at Quantico, Va., and at Camp LeJeune, N.C. She also took part in amphibious warfare demonstration and exercises during annual summer midshipmen training cruises. Each spring she also joined in maneuvers of the Atlantic Fleet in the Caribbean, making amphibious assaults on Vieques, P.R. In addition, the landing ship replenished several isolated bases in the Arctic. Her duties took her to many ports in the Caribbean and on the eastern seaboard of the United States. On 1 July 1955, LST‑983 was named Middlesex County. Her status was reduced to in commission in reserve 1 October, and she decommissioned at Green Cove Springs, Fla., 10 January 1956 and entered the Atlantic Reserve Fleet. Middlesex County recommissioned 27 September 1961 and soon established a pattern of alternating operations between the Virginia Capes area and the Panama Canal Zone training marines and soldiers in the techniques of modern amphibious warfare. In the spring of 1962 she participated in operations DEMOLEX, and amphibious demonstrations for President Kennedy at Onslow Beach, N.C. That fall she was awarded the battle efficiency E for being the top ship of 16 activated for the Amphibious Force during 1961. News of the Cuban missile crisis found Middlesex County heading home for Virginia. Ordered to Port Everglades, Fla., she immediately began training with troops of the Army's 1st Armored Division. The efficiency of the naval quarantine of Cuba and the mobilization of American Armed might quickly persuaded the Soviet Union to withdraw its offensive missiles, enabling Middlesex County to return home 16 December. On 17 May 1965, the LST steamed to the assistance of Panamanian National Guard Launch No. 2. The next morning they found the craft adrift, dispersed food and water to 50 prisoners and 5 guards, and took the launch in tow to return her to Isla Cobia that night. A year later she again served as a good samaritan of the sea. Her two LCVPs were used to refloat La Bonita after the tramp steamer had run aground near Tumaco, Columbia 11 May 1966. Late in June she carried heavy equipment for the Inter Oceanic Canal Study Group. After overhaul in the spring of 1967 begun at Maryland Shipbuilding & Drydock Co., Baltimore, and completed at Jacksonville Shipyards, Jacksonville, Fla., the LST returned to Little Creek 19 June for training. She got underway 25 August for another deployment with the Canal Zone Amphibious Group. During this deployment she transited the canal on four occasions for operations along the Pacific coast of Central and South America. After returning to Little Creek 17 December, the tank landing ship resumed training operations. Throughout 1968, Middlesex Cty. conducted local operations in the Atlantic and Caribbean, continuing these operations into 1969. Middlesex County (LST‑983) received one battle star for World War II service.